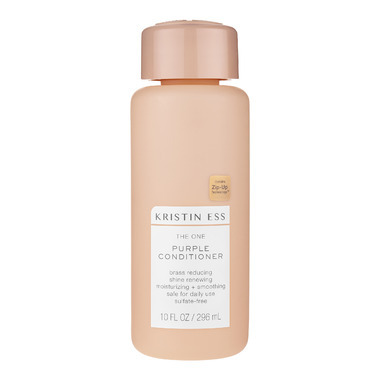 For those who are really prone to unwanted brassiness, take at-home toning one step further with this purple conditioner. Created with moisture and tone in mind. Most people who experience brassiness have had bleach or color applied to their hair so moisture and shine are a top priority. This can be used with or without The One Purple Shampoo. 1. After shampooing + rinsing, depending on the thickness of your hair, squeeze a dime to quarter-sized amount into your palm. 2. Apply to wet hair starting at the ends and working your way up to the top, avoiding the last inch or two near the root. 3. Wait 3 minutes, then rinse thoroughly. Tip: If ever you over-do it and your hair is too ashy for your liking, just shampoo once with The One Signature Shampoo to remove one level of tone. Ingredients: Water, Cetearyl Alcohol, Fragrance, Behentrimonium Chloride, Hypnea Musciformis Extract, Sargassum Filipendula Extract, Litchi Chinensis Pericarp Extract, Gelidiella Acerosa Extract, Salvia Hispanica Seed Oil, Panthenol, Algin, Carrageenan, Coco-Glucoside, Hydrolyzed Keratin, Chitosan, Bis-PEG-18 Methyl Ether Dimethyl Silane, Cetrimonium Chloride, Cetearamidoethyldiethonium Succinoyl Hydrolyzed Pea Protein, Guar Hydroxypropyltrimonium Chloride, Propylene Glycol Dicaprylate/Dicaprate, Isopropyl Palmitate, Caprylic/Capric Triglyceride, PPG-1 Trideceth-6, Trideceth-12, Sorbitol, PEG-8 Dimethicone, PEG-14, PEG-33, Silicone Quaternium-3, Polyquaternium-37, Xanthan Gum, Cetyl Alcohol, Citric Acid, Glycerin, Methylisothiazolinone, Methylchloroisothiazolinone, Ext. Violet 2. I normally never buy a purple conditioner when I buy a shampoo but glad I did with this one! Definitely worth it with the shampoo and you can see the difference. Bought this with the shampoo and I love it! Definitely tones better than most salon brands Iâ€™ve used and doesnâ€™t dry my hair out. Will repurchase! The smell of this product is overwhelming!!! Do not purchase if you have even the slightest sensitivity to scents. I find that the shampoo is better at toning than this conditioner. Also, with fine blonde hair, this doesn't do much to detangle or really condition at all. I find I have to mix it with another heavier/better conditioner to ensure I can get a comb through my hair after it's washed. I bought this also with the shampoo and I feel the same way about the conditioner. I love the scent, and I donâ€™t find it lasts a long time at all. It also makes my hair soft and voluminous. I havenâ€™t had my hair blonde for a month yet so I havenâ€™t noticed any brightening as of yet. Iâ€™m so disappointed with this product. Firstly the scent is so overpowering, it is all you can smell, for days! Even after washing, the scent remains. It also left my hair looking dull and greasy. The one star is for the purple/ash tone, which was quite nice. I bought both the shampoo and conditioner, but wonâ€™t use either again. This smells heavenly. Super softening and gentle and is keeping my blonde bright. After trying lots and lots and lots of products, in a wide price range, to tame brassiness, I am so happy that I found THE ONE THAT FINALLY works for me - I bought both shampoo & conditioner and I LOVE them! This has quickly become my holy grail of purple/toning shampoos, and I have tried a LOT. Be very careful with how long you leave it in because it's very strong and effective. You may not need to leave it in for any longer than it takes to lather. Leaves my hair feeling clean and soft - not stripped. I use this with the Purple shampoo. You donâ€™t need much... it has left my hair soft and well conditioned. Love this conditioner. Leaves my hair so soft. And it smells amazing! Does not leave a purple deposit in my hair, but tones it slightly with each use. Same as my shampoo review, not as good as the product I used previously for toning down brassiness. Does leave hair soft. I reviewed the purple shampoo in this line as well, and the two together are incredible! I've used purple shampoos and conditioners for years because I'm an ashy blonde and need to neutralize the tones often. There are no other drugstore options or high-end options that beat this. The conditioner doesn't weigh my hair down or make my hair greasy. Purple shampoos tend to be drying so sometimes the conditioners will be extra conditioning. This is not, which is great for my fine hair. I just spray some conditioning spray in post-shower to add any moisture I need back in (I use one by Yarok. Well.ca, please bring this brand in!). Couldn't recommend this combo enough! Took all the brassy tones out. Worked great! Really liked the shampoo and conditioner. Added moisture and softened my slight brassy tones. Scent is soft and pleasing. Ordered more products from this afordable line immediately and looking forward to trying them. 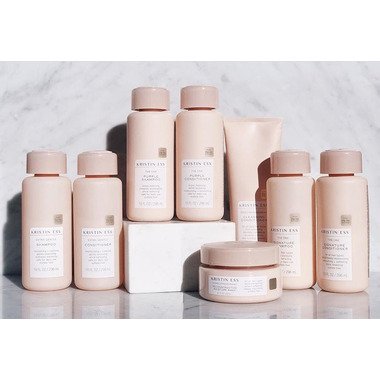 Planning to use the purple shampoo & conditioner every few washes and will use the lines signature shampoo and conditioner regularly. This along with the shampoo are incredible! Used to pay $$$ for thickening shampoo / conditioner but this has made my hair voluminous without even claiming to do so! Love the colour it gives my hair as well. Incredibly fragrant, even keeps smelling amazing the next day!